The Vice-Chancellor, Prof. Olusola Bnadele Oyewole delivering his Keynote Address at NIFST’s 36th Annual Conference and Annual General Meeting held at the UNILAG’s Conference Centre, recently. The Agricultural Transformation Agenda (ATA) of the Federal government of Nigeria has been observed to be capable of ensuring greater heights in food production, as well as restoring the nation’s lost glory in agriculture. The Vice-Chancellor of the Federal University of Agriculture, Abeokuta (FUNAAB), Professor Olusola Bandele Oyewole, made the observation last Monday, while delivering his Keynote Address at the 36th Annual Conference and General Meeting of the Nigerian Institute of Food Science and Technology, held at the University of Lagos Conference Centre, Akoka, Lagos. Professor Oyewole lauded the transformation agenda, saying its proper implementation would turn Nigeria from being a food importer to a self-sufficient and food exporting country. Further commending the initiative of the current administration, Professor Oyewole was confident that the agenda would transform the Nigerian economy, in meeting the future needs of the people as it is based on a set of priority policies and programmes. According to him, the nation’s current profile of being a net importer of food is worrisome, observing that the country in 2010, imported over N1.2 trillion worth of wheat, rice, sugar, fish and other food items. He said, “With ATA, Nigeria is expected to process all her agricultural produce, promote locally produced foods, make farmers prosperous and create jobs. ATA seeks to fix value-added chains for rice, cassava, cocoa, sorghum, cotton, maize, soybean, oil-palm, aquaculture and livestock”, he added. The Vice-Chancellor, however advised the Federal Government to work on the lapse in the transformation agenda which he observed, has failed to attribute roles and direct involvement of professional bodies, universities and other stakeholders, required to drive the mission of the agenda. 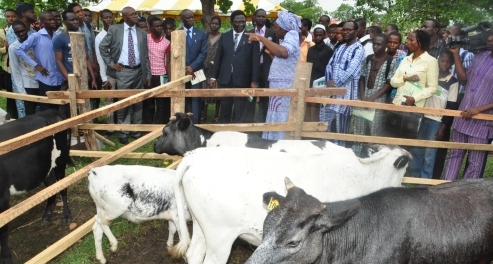 The Vice-Chancellor assured that the Federal University of Agriculture, Abeokuta, in line with its mandate, would further contribute to the goals of the transformation agenda by intensifying its activities in rural development, job creation, income generation and sustainable development. He said the University would not relent in “investing in pro-poor impact oriented market approach through information gathering, dissemination and provision of basic technological infrastructure to small holder farmers and processors”. The Keynote Speaker also commended the active roles of the Nigerian Institute of Food Science and Technology in ensuring sustainable food processing, but asked that it strive for the establishment of a National Innovation Platform, as a way of educating the masses on the interplay amongst food nutrition and wellness. The Vice-Chancellor was earlier at the occasion conferred with the Professional Fellowship of the Institute for his contributions to the advancement of Food Science and Technology, while the President of FUNAAB Alumni Association and Head, Department of Food Science and Technology of the University, Professor Lateef Sanni, was decorated with the Outstanding NIFSTers’ Award.